Near the southern tip of North Carolina, where I-74 and I-95 meet, there’s a town called Lumberton. 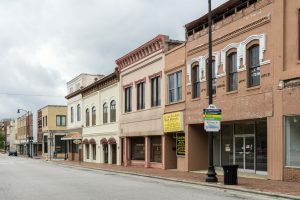 In 1995, the town became the two-time winner of the National Civic Leagues All-America City Award, which aims to recognize communities “whose citizens work together to identify and tackle community-wide challenges and achieve uncommon results.” Unfortunately, in a matter of decades, Lumberton has fallen from recipient of the All-America City Award to the number one spot on the FBI’s list of the top ten most dangerous cities in North Carolina. According to a 2016 FBI report, there were 393 violent crimes in Lumberton and analysts estimate an individual resident has a 1 in 55 chance of being raped, assaulted, or killed. 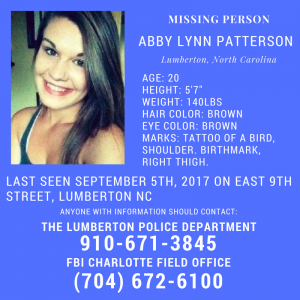 These overwhelming statistics could explain why the details emerging from Lumberton in recent months read more like a titillating summer mystery novel than a modern-day Mayberry—the citizens stewing in fear and suspicion as law enforcement continue to investigate the three murders and smattering of disappearances plaguing the small North Carolina town in the last year. On April 18th, 2017, the remains of two women were found in central Lumberton less than 100 yards from one another. The remains of Christina Bennett, 32, were found in an abandoned house after a neighbor called authorities about a rancid odor coming from the property. 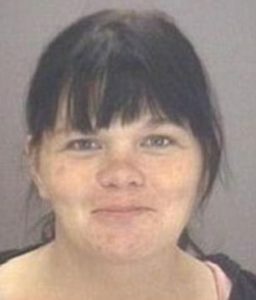 Police also discovered the remains of Rhonda Jones, 36, stuffed in a trash can not even a football field distance away. The remains of both women were in an advanced stage of decomposition, not only preventing authorities from establishing a time of death, but also preventing them from establishing a cause of death for both women. Police Captain Terry Parker confirmed the women were both identified through medical records. 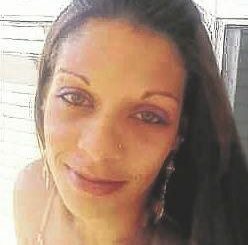 In early June, the remains of Megan Oxendine were found in another abandoned house on 9th Street in central Lumberton. 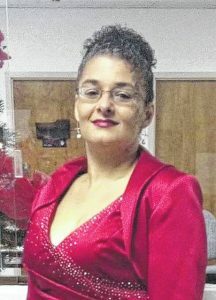 The discovery of her body came as a chilling twist to the citizens of Lumberton, as many recalled her interview with news media the day after the discovery of the remains of her friend, Rhonda Jones. In April 2017, Oxendine joined many across the community who had spoken out about the loss of Jones. She told CBS North Carolina, “I ain’t never seen her act out or nothing. She’s just quiet. She didn’t really mess with too many people.” Just as, in the cases of Christina Bennett and Rhonda Jones, Oxendine’s state of decomposition prevented authorities from establishing both time of death and cause of death. This makes her the third woman found in a four-block radius in central Lumberton in two months. Although law enforcement has yet to link the deaths of the three women, Private investigator Thomas Lauth of Lauth Investigations International speculates that the discovery of their remains could be the patterned behavior of a single perpetrator, “Commonly in cases where the victim(s) are first missing then found deceased in a very small geographic area, the perpetrator of such a heinous crime will kill again, and resides within a 10-20 mile radius. Perhaps even had prior interaction with the victim or their family. 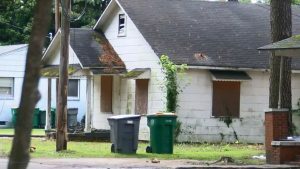 Further, if the community has a high rate of crime from meth or heroin, it could bring outside traffickers and other transients into the community which increases the propensity for murder.” Police have reported the neighborhood has been a hive of criminal activity for years but are unable to connect any of the deaths to the criminal element. It was in June of 2017 the Lumberton Police Department officially requested the assistance of the Federal Bureau of Investigation in what is officially called “the death investigations” of the three women. As recently as last month, March 2018, investigators conducted a canvas of the area where the three women were found. Over the course of three days, they knocked on 800 doors, conducted 500 interviews, and continued to encourage the public to come forward with any information. Five women have either disappeared or been discovered dead in the same neighborhood over the course of six months. A little over a year later, police and federal investigators have yet to establish a cause of death in the cases of Christina Bennett, Rhonda Jones, and Megan Oxendine. They have yet to name any suspects in their deaths. They are currently offering $30,000 for anyone who can lead investigators to the truth of what happened to the three women. 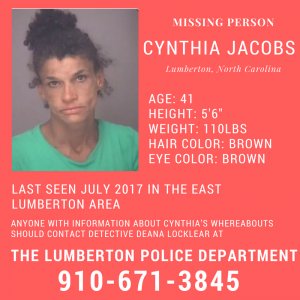 Cynthia Jacobs and Abby Lynn Patterson have not had contact with their families since they were last reported seen in Lumberton. Anyone with information on the whereabouts of the missing women should call the Lumberton Police Department at (910)-671-3845.